GRID Autosport 1.3 Update Adding More Graphics Options, Gamepad Control Customisations and More. Feral Interactive GRID Autosport is still one of the best racing game of all time because of its console quality graphics. It's available on iOS a long time and has consistently gotten better over time with some amazing updates. This is a fully premium game and its gets even better today with new update 1.3. Version 1.3 has new performance options for iPhone 8 and later devices. These will let you prioritize or performance. The 3rd generation iPad Pro will get ultra high performance with this update. The other enhancement is for replays. You can now hide the UI during the replays and also changes the camera Angle for replays. Gamepad controls can now be customised with these new update. 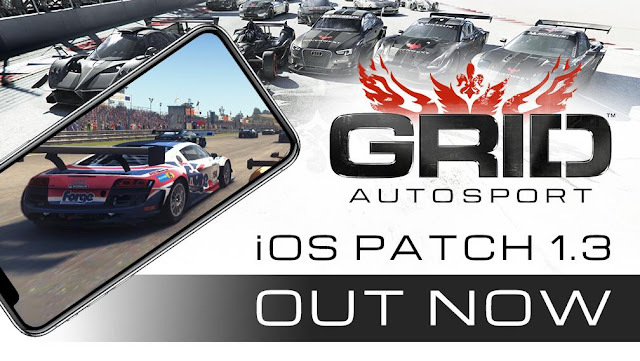 GRID Autosport also requires iOS 12.1 and later now. Guys it's very heavy game in terms of graphics and also storage. Now talks about android release date. It's coming to android very but it's running only on High End Devices. You can Download it for iOS from Click the App icon below.